A professional quality, gas trimmer head replacement that will save time, money and frustration. This commercial grade model works just like the original PivoTrim, but it features more durable materials in order to hold up to heavy, everyday use. It's perfect for groundskeepers and landscapers, but also ideal for any homeowner that would prefer the best in durability and functionality. It is compatible with any straight shaft gas trimmer, and installs in a matter of minutes. Once in place, it will prevent line breaks by allowing the string to pivot out of the way when met with too much resistance. Instead of going slow and being careful, or stopping work to reload string every five minutes, the PivoTrim Pro will allow you to power through any job even if there are sidewalks, driveways or fences involved. 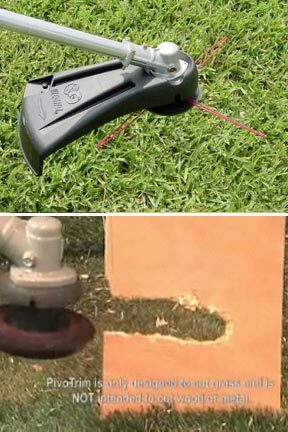 Blast through weeds and grass, and trim all the way up to the edge, but never stop to reload because with this replacement head, your line will last twenty times longer. When you do need to change the string, the four seconds that it takes will be far more enjoyable than wrestling with the bump feeder you are annoyed with now. Comes complete with all hardware needed for any model, and enough line to load it twice. Order Yours Today! 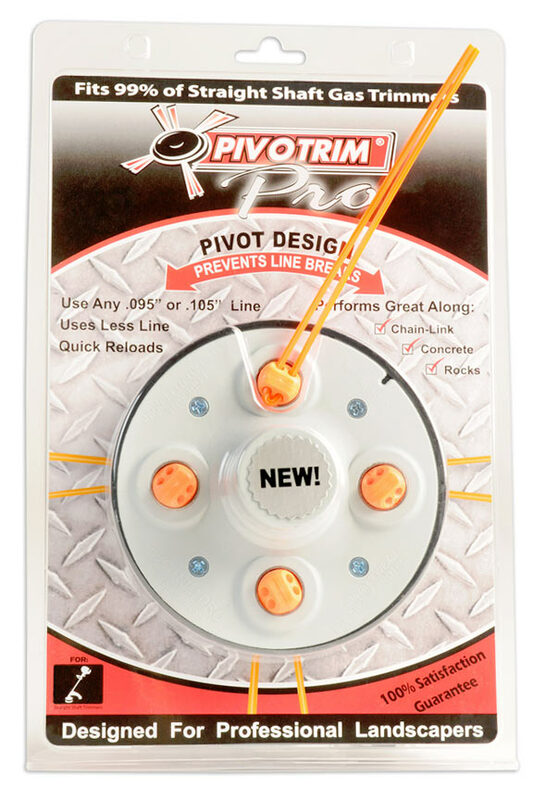 PivoTrim Pro - Prevent line breakage and load new string in a fraction of the time when it eventually wears down. Trim against fences and concrete without trouble. Order Yours Today! The Pivotrim I ordered works very well, much fewer line changes. I'm satisfied, it performs ad advertised. If the manufacturer wanted to improve this product or offer a tougher option - redesigned and built to handle .135 diameter line, I'd purchase it also. I'M 84 YEARS OLD, BAD BACK. SO I PUT TOGETHER A UNIT OF -10AMP GREEN WORKS TRIMMER WITH A ROYBI CURVED SHAFT, A PIVOTRIM PRO. HEAD WITH 4 .125 LINES AND HANDED IT TO A 16 YR. OLD 6 FT LAD. HE SWINGS IT LIKE A METAL DETECTOR AND CUTS A 36 INCH SWATH AS GOOD AS A 36" RIDING MOWER. CLEANS DEEP TREE WELLS IN A SNAP. BEST INVESTMENT I'VE MADE IN A LONG TIME. I BOUGHT 2 OF THEM, SO I AM NEVER WITHOUT. RECOMEND, YOU BET. SORRY I COULDN'T USE IT ON THE SKIL. IT WAS TO HEAVY FOR ME. THE OTHER ONE I GAVE TO MY SON AND HE LOVES IT. I AM RETURNING JUST ONE. I was tired of the "bump and go" type of line head that never go no matter how much I bumped. Then you need to stop feed the line by hand or worse, take the whole head apart, untangle the mess, feed the line, and then reassemble. Now all I have to do is see how much line is left before I start, if more is needed just remove old line and pull new one through hook which equals less that 1 minute to put all 4 lines in, simple as can be! Yes. It will definitely work on this model, but getting the speed spool off can be a little bit challenging. Once you get it off, the pivotrim will install in a matter of seconds. 1) Position the pawl on the spool so that it hooks onto the spring. You will notice an access hole on the side of the head, next to the shaft. Slide your screwdriver in. 2) Turn your screwdriver inside the hole until the pawl lifts off its retaining hole. 3) Remove the screwdriver and pawl. 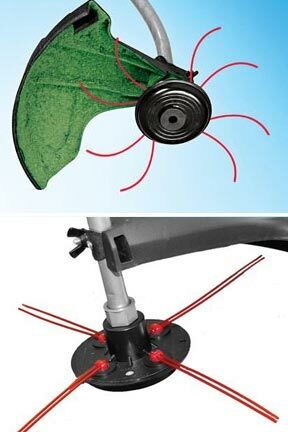 4) Locate the locking nut and bolt on top of your trimmer head. Unscrew to loosen and remove. Those four steps will get the red plastic part off and prepare you to install this replacement. Use the steps below to complete that part. 1) Check your owners manual to see how to lock the shaft, then do it. It may be a key hole, or it may require a wrench. 2) Completely take off old head to expose the threaded shaft. 3) Look through bag of hardware, and find the nut that screws on easily. 4) Take that nut and insert down into the hex shaped cavity on the pivotrim. 5) Hold the nut in place, and then twist to tighten head in position. 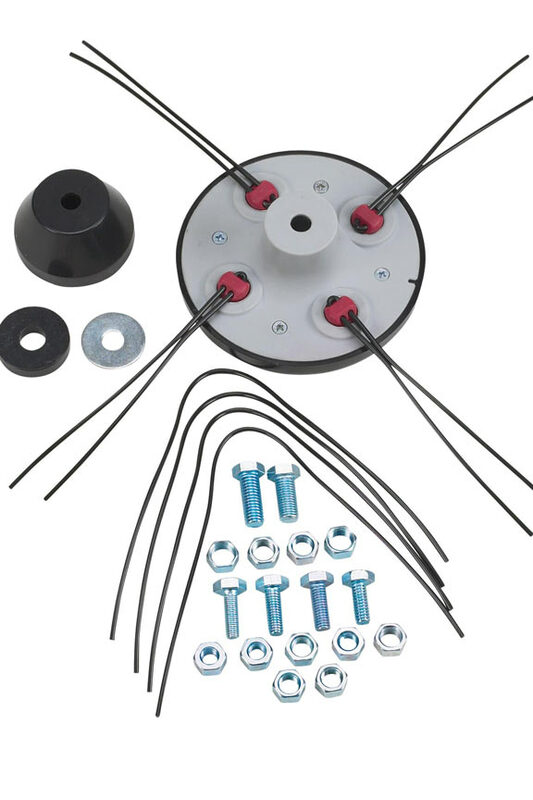 Shaft rotation should be locked prior to installation. Use 2 lines for curved shaft model trimmers. Do you provide line for life? Yes. We can provide line for life. We do not pretend like it is free though. The "free" line you see advertised will cost you $7.95 for 20 pcs. after shipping. We do not pretend that it is free, and then we charge actual shipping costs. When you re-order line from us, you end up with 24 pcs. and a lower out of pocket cost. Order the 100 piece pack and it will be even cheaper. I have a Stihl FS38 trimmer - will this trimmer head/line work with this trimmer? Your trimmer is probably a bit under-powered for this version. We would recommend going with the original PivoTrim instead. Will it work with Echo straight-line timers? Also, specs say it was designed to use.105 line; why does it come with .095 and are replacement lines .095? Yes, it will work with your trimmer. It is designed for use with either .095 OR .105 line. The package contains .105.
can I buy parts for my pivo trimmer? The buttons that hold the string have worn the tops off. Help Thank you Love the head. Yes you can. Give us a call and we would be happy to help you out. Willit fit on a Honda straight shaft trimmer? do you also offer a 4 blade tool that fits the cutting head as well as the strings as shown on TV ads? As of today, no, we do not offer the tool you are asking about. Do you have one for a curved shaft trimmer? Yes. Just go with the regular version. It will work on your curved shaft model. will it work on a dr trimmer? Will this work on a Yardman model YM20CS? It will fit on your curved shaft trimmer, but it may not have the power necessary to use this commercial version to its full ability. Without enough power, you'll have to use it with two strings instead of four, so consider going with the original model here. Will this string trimmer head work on curved shaft trimmers also? In general, curved shaft trimmers offer less power. It will certainly fit, but your motor may not have the power to spin it effectively, unless you run it with two lines. The design is the same, but the material is more durable, so it's heavier. Will the Pro model work on a 4 cycle Cub Cadet trimmer? Yes. The Pro version is heavier due to more durable construction, so it needs a powerful motor to operate well. Straight shaft trimmers typically have the power necessary. Will the PivioTrim Pro fit a FS74 Stihl? Thanks. will this wok on a Husquavarna 128LDX? Will this head fit a Stihl FS45? Yes. It should be compatible with that model.